As the last leaves fall from the trees, this is the time of year to notice and marvel at what else is growing in woodlands and on isolated hawthorn trees on Dartmoor. I’m talking about the unglamorous but fascinating lichen and fungi which still thrive in the damp moorland climate. 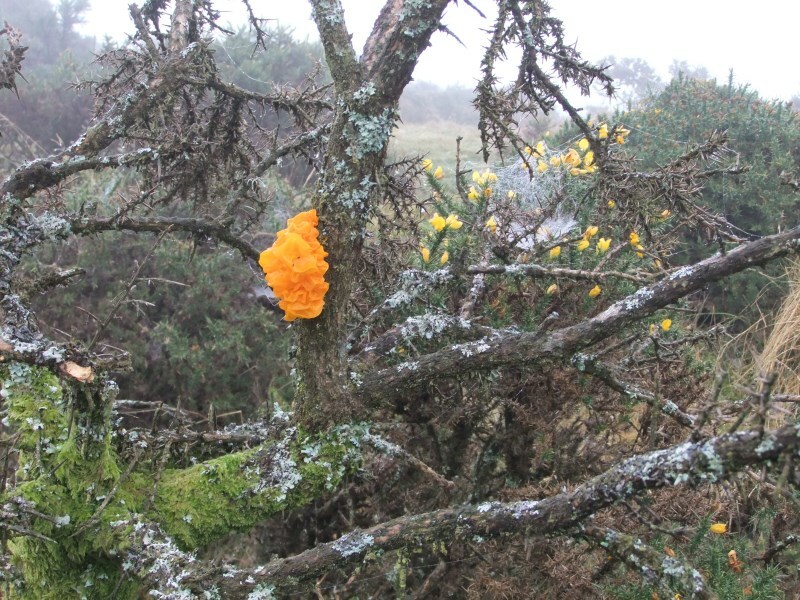 It started with looking up what the orange, jelly-like substance was that dots gorse bushes and dying trees and becomes particularly noticeable in autumn. It’s a fungus and has the most delightful set of folk names: witches butter, yellow brain, golden jelly fungus, yellow trembler, and tripe fungus. (The proper Latin name is Tremella mesenterica.) It flaunts its bright colour at this time of year, then becomes crusty and dark orange as it ages. If it appeared near your house in olden times, it was considered to be a sign that a witch had cursed you and the cure was to prick the jelly lobes and let the moisture drain out. It’s not poisonous, but is tasteless. It grows all over the world and in China gets put in soup to achieve that gelatinous effect. 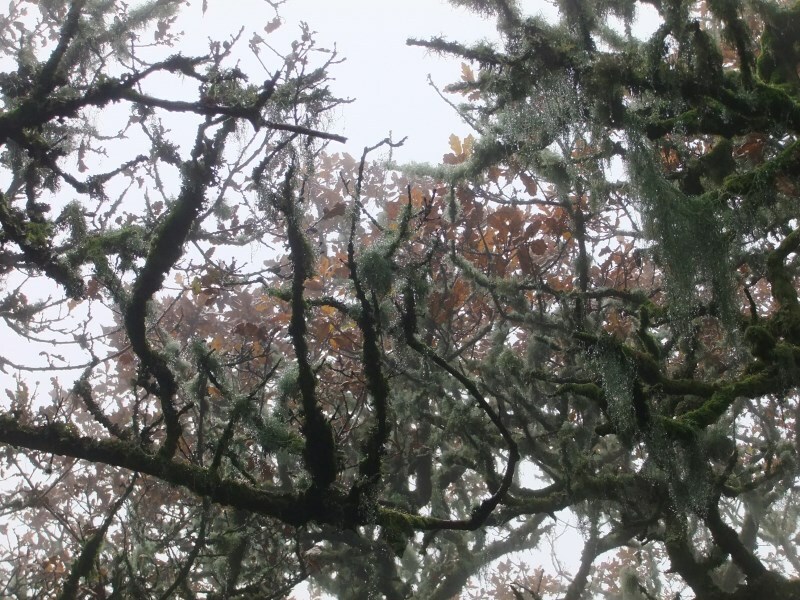 The other tree-borne delight that leaps into view in a Dartmoor winter is known commonly as old man’s beard, and it is a lichen (of the Usnea genus). Lichens are extraordinary examples of symbiosis, as they are a partnership of fungi and algae: as one scientist has put it, they are “fungi that have discovered agriculture”. The algal partner, being green, synthesises sugars which nourish the fungal partner. The fungus provides protection, mostly against the weather, so the algae have a more stable and constant environment to live in. 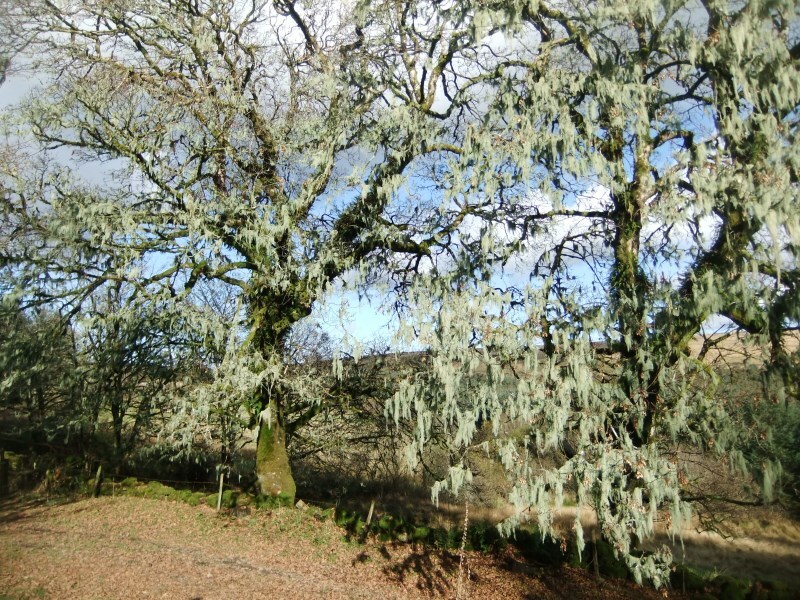 Lichen can live in the most extreme environments, but one thing they can’t cope with is air pollution - the presence or absence of lichen can be used by scientists as a good test of air quality over a period of many years. The abundance of old man’s beard in many parts of Dartmoor is an indicator that the prevailing winds are not blowing from the Midlands but straight off the relatively clean Atlantic. Not surprisingly, since the Industrial Revolution, Usnea has become quite rare outside of southwest England and Wales. Usnea comes in many different forms, but they all hang from trees and resemble grey/greenish hair. 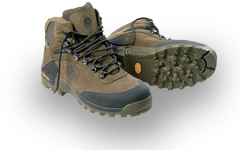 They land as spores onto bark, take hold and then spin nets or lines to “fish” for moisture and nutrients from the air. They live on trees, but don’t sap their strength – they can be seen to survive equally well on dead trees. Again, there’s a host of folk names: witches’ whiskers, apothecary’s beard, Merlin’s beard and there have been many medicinal uses for Usnea in the past. The usnic acid it produces has antibiotic and antifungal properties, so lengths of it could be used as bandages before sterile gauze was available. 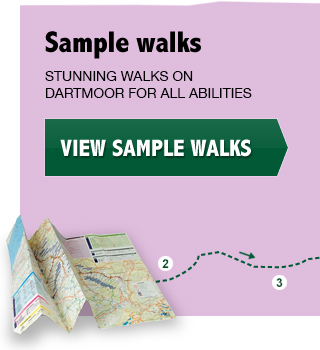 It is considered a strong immune tonic, a remedy for whooping cough and a rich source of Vitamin C.
There are other lichens to be found in the Dartmoor woodlands. The Parmelia genus takes a leafy shape and has the common name of crottle or skull lichen. It grows in flat gray-brown rosettes (5 to 10 centimetres across) and according to folklore, it was believed to be an effective treatment for epilepsy if found growing on an old skull, especially that of an executed criminal! A rather rare lichen is Lobaria pulmonaria which grows on the bark of deciduous trees as well as on rocks. Folk names include tree lungwort, lung lichen, lung moss, oak lungs. My favourite fact about this one is that it gets a suntan… in the shade its leafy growths are grey green, but if exposed to sunlight they turn dark brown.